Brammo Blog : Long, but beautiful day. 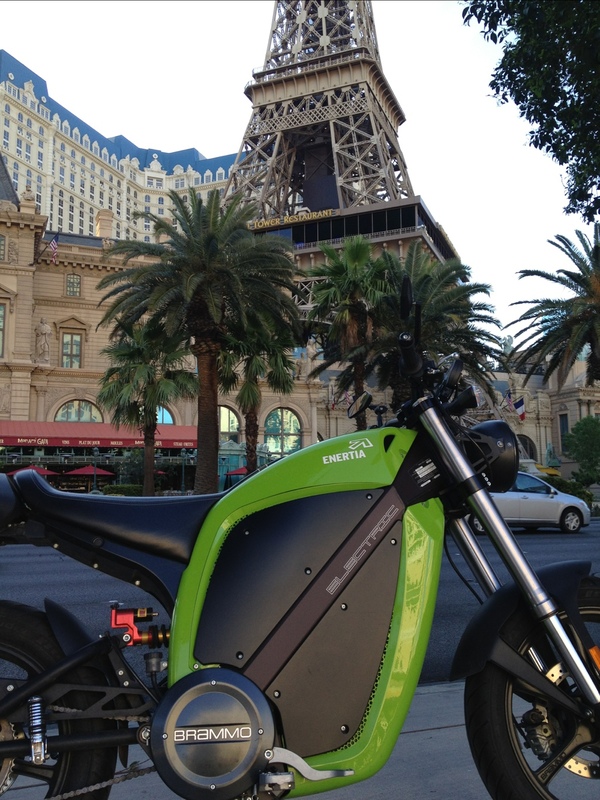 Blog 24: where I lay in motel bed and listen to the Enertia charging in the bathroom. The battery fan droning is almost hypnotic…I doubt I can write much as sleep is pulling down my eyelids with gentle fingers. 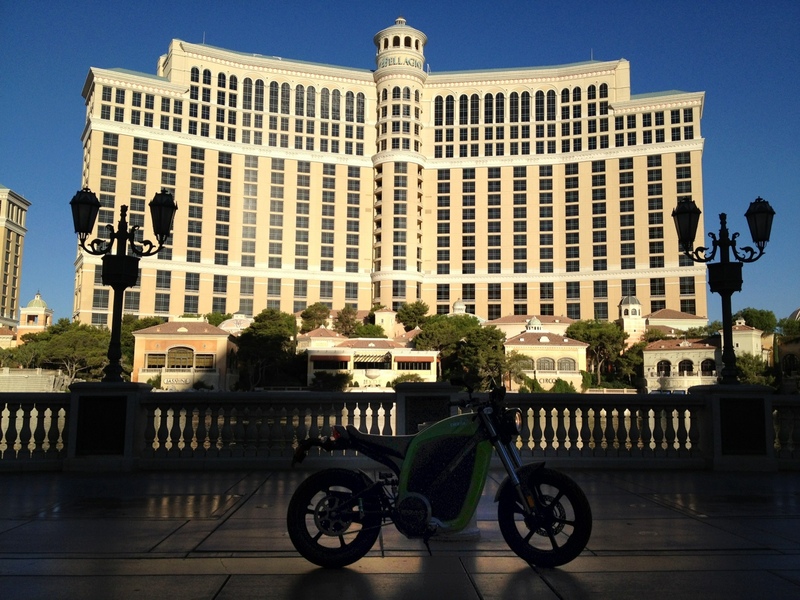 Got up at 6:30am to ride the strip. Last night the strip was beautifully bathed in neon glow and bustling bodies…and way way WAY too many cars. 9 miles took 1 1/2 hours. Painful. I miscalculated. No eastern mountain like at home to block the early sunrise and keep the brightness of day locked away for just that little bit longer. By 7am the Sun was a fair amount up in the sky, much more than expected. 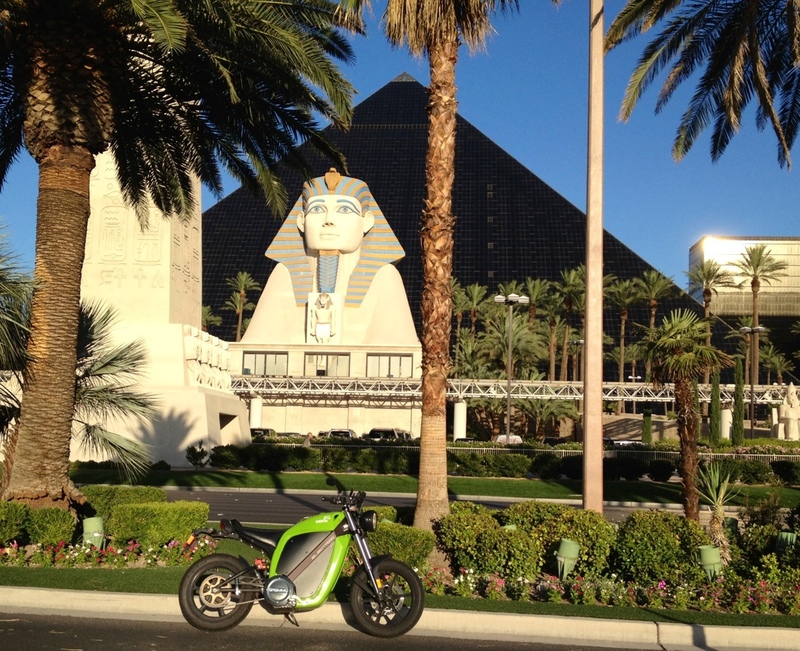 But I still had a nice little ride this morning before packing and heading out of Vegas. Then New York City. 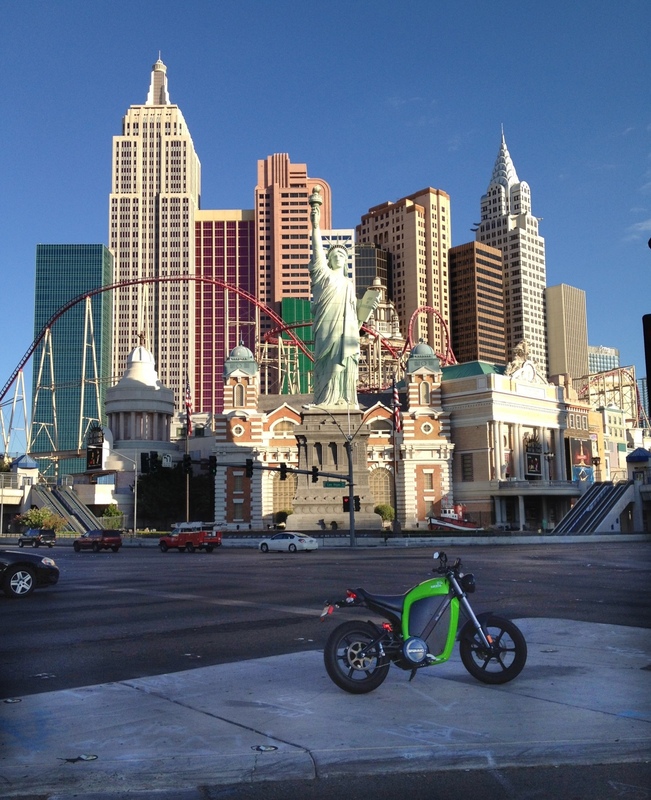 Riding on the strip for the second time helped me know where to park and not get hit by cars. Decided that 8 hours and 500 plus miles was too short of a day, so took the long way…Coastal Highway 1. Beautiful road. But added 70 miles and 1 1/2 hours to the ride. But got to see and smell the ocean. I don’t know what it is, memory or reality or a mixture of both, but the ocean air in Cali is different than the ocean air of the East coast. Stronger, saltier. Perhaps it is the fact that the wind comes off the ocean stronger and is held in more by the coastal mountains. It is the one thing I miss about living in the desert. 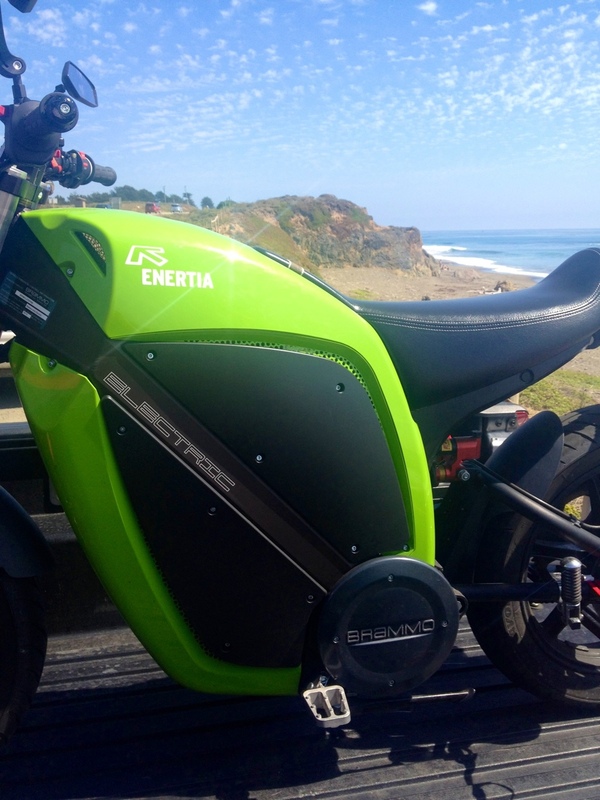 And then a nice ride up the coast through Big Sur, Carmel, Pacific Grove and finally to my hovel in Salinas with the bathroom taken up by my quietly droning Enertia. 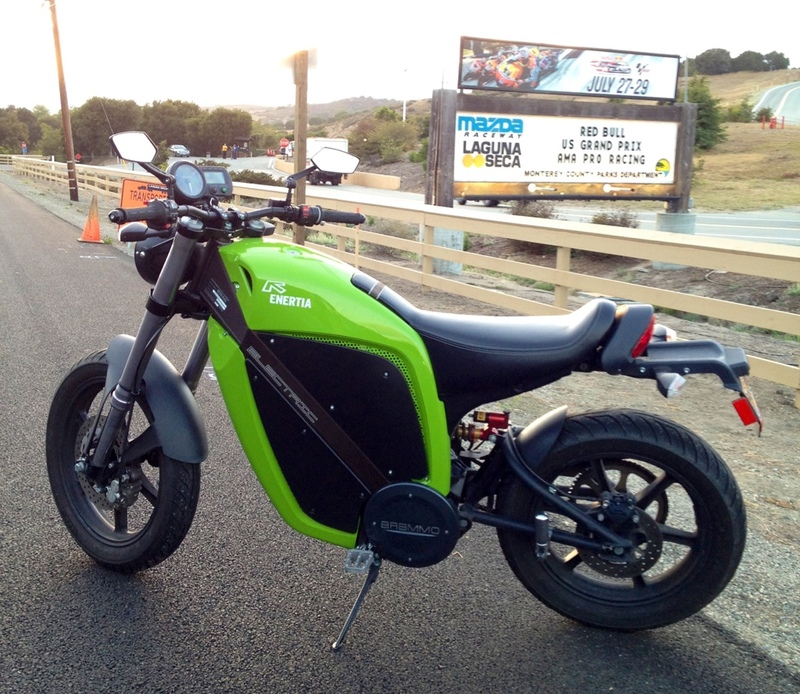 I unloaded the bike and rode down to Laguna Seca raceway. it was in essence a scouting ride. How far is it? How long will it take to ride from the motel? How much battery will it use? Mostly it was a reason to ride in the open air after being in a cage all day. Yesterday it was 100 degrees in Las Vegas. When I get into Salinas it was 60 degrees, overcast and moisture hung heavy in the air (not used to that in Albuquerque). The ride to Laguna Seca is colder than I expected. The road to Laguna Seca is 55 mph, some 65 mph. So I’m riding fast as dusk is falling and the temps are dropping and the cold, wet air seeps into bones. I only brought fingerless summer riding gloves and fingers groan a bit. No scarf and neck chills. It’s freaking SUMMER…why would I need gloves and scarf? Moisture…I have forgotten you…too many years in the desert. I packed a weeks worth of clothes…but I packed a weeks worth of New Mexico summer clothes. I might be off to the store tomorrow to buy some long sleeve shirts and gloves with freaking fingers still attached. Some great writing there, Gavin. Maybe that charging fan is your muse. I’ve been cold and hot at Laguna Seca. The key is to dress in layers. Perfect description of the Pacific opposed to the Atlantic. However, the northern Atlantic is different in its own way. Why not put your blog address on facebook so more folks can find and enjoy it? I listened to 16 hours of the Keith Richards autobiography on my drive out…I now think in an English accent…bugger it all, me head feels like a cast off from Secondary Modern. Who read the book on CD? How did you like the book? Saw that you put your Blog on Facebook. Very good. Two people…Johnny Depp is Keith when he is young…does a good job, of course. Somebody much more British does Keith after he leaves home. Great job, though you lose a word here and there from the accent.